Buried somewhere deep below the layers of predictable plotting, there’s an inspired idea at the core of Grudge Match. 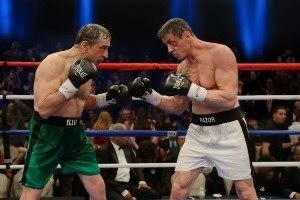 Pitting Robert De Niro – the one-time raging bull himself – against Sylvester Stallone – the six-time Rocky Balboa – against each other in a comedy about aging boxers who refuse to hang up their gloves could’ve resulted in a far more inspired movie that this. No need to rub it in too much; the reviews have been generally merciless (an embarrassing zero percent “fresh” from Top Critics on Rotten Tomatoes) and the film finished outside of the top ten for the Christmas weekend box office. 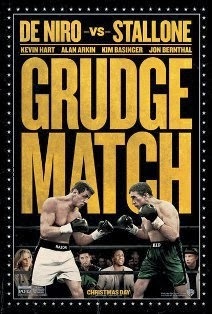 The first mistake was the decision to make Grudge Match essentially a remake of Rocky Balboa. That 2006 return of Rocky shocked many critics and filmgoers alike by being a heartfelt, well-written, and generally subtle character piece. Stallone vowed it would be the final Rocky movie, but with Grudge Match he has almost gone back on his word. Seems Stallone didn’t really want to stay out of the ring. Seeing him train, drink raw eggs, and lace up the gloves just isn’t the same when he’s portraying someone other than Balboa, with no adrenaline-pumping Bill Conti score behind him. Instead we get Henry “Razor” Sharp, a former champ long past his prime, now working a thankless factory job. He cares for his aging former trainer, Lightning (Alan Arkin, the stand-in for Burgess Meredith’s Mickey). 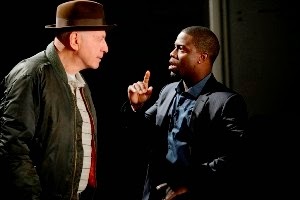 When aggressive up-and-coming promoter Dante Slate Jr. (Kevin Hart) offers him the chance to do motion-capture for a video game featuring his arch nemesis Billy “The Kid” McDonnen, Razor agrees only if he and Billy never actually cross paths. Of course, it doesn’t go down that smoothly, with Razor and Billy’s on-set brawl going viral on the internet. Remember how the computer-simulation between Rocky and Mason Dixon spurred demand for a real, flesh-and-blood fight in Rocky Balboa? That’s exactly what happens here, with the planned rematch – dubbed “Grudgement Day” – sparking a fervor that sweeps across America. 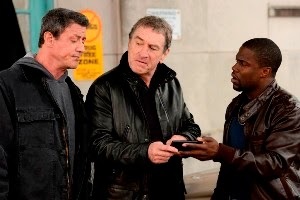 Both Stallone and De Niro have made enough bad movies that their legacies really aren’t going to be tarnished by the laziness of Grudge Match. And to his credit, De Niro lets the sparks fly with an energetic performance. His interactions with his estranged son B.J. (Jon Bernthal) and young grandson Trey (Camden Gray) are the best thing about the movie. The father-son bonding stuff is clichéd, to be sure, but it beats the romantic subplot Stallone is saddled with. Kim Basinger seems lost as Sally, former lover of both Razor and The Kid. Why Razor is still sprung for Sally, who slept with his sworn enemy (even having a child by him), is a mystery the screenplay never solves. And speaking of the screenplay, not enough was done (if anything at all) to distinguish Stallone’s Razor as more than ersatz Balboa. Taken at face value, there are a few decent laughs scattered throughout Grudge Match, but it’s mostly a lost cause. By the time we get to the big fight – staged without humor and without the genuine pulse-raising thrills of a Rocky fight – it becomes clear that this is a huge missed opportunity. Stick around after the credits start to roll for not one, but two tag endings – the second of which is the funniest bit in the whole picture.